Pigeons are found throughout the United States (including Hawaii), southern Canada, and Mexico. Pigeons are highly dependent on humans They are commonly found around farms, parks, city buildings, bridges, and any other structures that will provide them with food and sites for roosting, nesting, and protection from predators. Pigeons are primarily grain and seedeaters. They also will feed on garbage, livestock manure, insects, or other food materials provided for them intentionally or unintentionally by people. In fact, in some urban areas the feeding of pigeons is considered a form of recreation. They require about 1 ounce (30 ml) of water daily. They rely mostly on free-standing water but they can also use snow to obtain water. 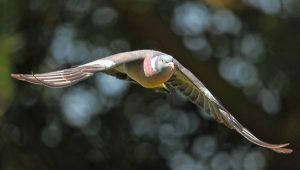 The common pigeon was introduced into the United States as a domesticated bird, but many escaped and formed feral populations. The pigeon is now the most common bird pest associated with people. Pigeons inhabit lofts, steeples, attics, caves, and ornate architectural features of buildings where openings allow for roosting, loafing, and nest building. Nests consist of sticks, twigs, and grasses clumped together to form a crude platform. The females lay 1 or 2 eggs which hatch after 18 days. The male provides nesting material and guards the female and the nest. The young leave the nest at 4 to 6 weeks of age. More eggs are laid before the first clutch leaves the nest. Breeding may occur at all seasons, but peak reproduction occurs in the spring and fall. A population of pigeons usually consists of equal numbers of males and females. Pigeon droppings deface and accelerate the deterioration of buildings and increase the cost of maintenance. Large amounts of droppings may kill vegetation and produce an objectionable odor. Pigeon manure deposited on park benches, statues, cars, and unwary pedestrians is aesthetically displeasing. Around grain handling facilities, pigeons consume and contaminate large quantities of food destined for human or livestock consumption. Pigeons may carry and spread diseases to people and livestock through their droppings. They are known to carry or transmit pigeon ornithosis, encephalitis, Newcastle disease, cryptococcosis, toxoplasmosis, salmonella food poisoning, and several other diseases. Additionally, under the right conditions pigeon manure may harbor airborne spores of the causal agent of histoplasmosis, a systemic fungus disease that can infect humans. The ectoparasites of pigeons include various species of fleas, lice, mites, ticks, and other biting insects, some of which readily bite people. Some insects that inhabit the nests of pigeons are also fabric pests and/or pantry pests. The northern fowl mite found on pigeons is an important poultry pest. Pigeons located around airports can also be a threat to human safety because of potential bird-aircraft collisions, and are considered a medium priority hazard to jet aircraft by the US Air Force. 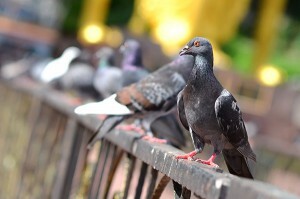 Structures inhabited by pigeons can sustain damage from droppings and harbor disease. The droppings can also make structural surfaces slick and hazardous to walk or climb on. Washing acidic accumulations of droppings to prevent structural damage can cost thousands of dollars per year. The longevity of roofing materials can be adversely affected by droppings, resulting in expensive replacement costs. Employee health claims and lawsuits resulting from diseases or injuries attributed to pigeons are also very expensive. An integrated pigeon management program incorporating lethal and nonlethal control techniques is well worth the investment when considering the economic damage and health threats caused by large populations of pigeons. Elimination of feeding, watering, roosting, and nesting sites is important in long-term pigeon control. Discourage people from feeding pigeons in public areas and clean up spilled grain around elevators, feed mills, and railcar clean-out areas. Eliminate pools of standing water that pigeons use for watering. Modify structures, buildings, and architectural designs to make them less attractive to pigeons. Pigeons can be excluded from buildings (in some cases very easily) by blocking access to indoor roosts. Bird Spikes and bird netting are mechanical repellents that can be used to exclude pigeons. Wire and cable systems are effective and less noticeable means to stop pigeons from roosting. Electrical shock track systems are also very effective methods of stopping birds from loafing on structures. Frightening systems have little to no permanent effect on roosting pigeons.